This entry was posted in Food and tagged Black puddung, Elizabeth Barret Browning, food, ideas, photography. Bookmark the permalink. And I think I need to find your black pudding supplier.. cheers! Love your blog! Hope we can meet – would be great. I half of my time live in Aberdeen – are you here too? Dutch husband prefers it with apple though he’s been known to eat the odd slice with an egg…or two . But as part of a hearty breakfast is the best way of all , of course , with potato scones , proper sausage and bacon ! 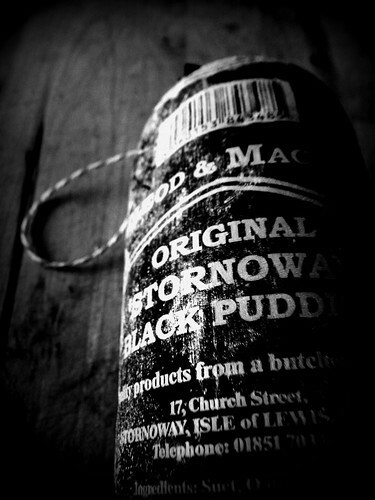 I love black pudding and Stornoway black pudding is one of my favourites. I do eat it most often with apple but it also works well when added to the mix for burgers. And one of our local farms makes a pork and Stornoway black pudding sausage I’m happy to say. Lol, thanks for helping out one very confused American! Thornberrie – Suspect that puts a few hairs on one’s chest! Phil – In a burger, you say? I’m intrigued. May have to try this. Rachel – Hello! Black pudding is a kind of sausage made from pigs blood, oatmeal and fat. IT’s a dark red colour raw but goes black when cooked. You slice it thickly then grill or fry it. It’s very, very good! And yes, steak and kidney pie does have kidney in it. Not one of my favourites though. Hope that’s helped! Ha ha, wow, and here I was hoping kidney pie was called that because it had kidney beans in it! No such thing as “kidney pie” – the dish is called “steak-and-kidney pie”! I get the impression that Americans imagine a juicy T-bone steak with a piece of kidney pie on the side. In fact, the pie contains both the “steak”; cubes of what you would probably describe as pot-roast, and the kidney, which usually makes up about a third of the meat, adding a distinctive texture and flavour without being overpowering. The meat, in a rich gravy can either be encased in short-crust pastry or covered with a puff-pastry lid and baked in the oven.. A related dish, “Steak-and-Kidney Pudding” uses the same filling in a case of soft suet pastry and is steamed rather than baked. I can think of nothing better. I’ve never had British-style black pudding, but I’ve had morcilla in Argentina, and sometimes I dream about it, it is so good. MMmmmmmmm, morcilla. Since I love morcilla so much, I’m sure I’d love black pudding. Blood rocks! I hope you’re well. Your marathon accomplishment impresses the heck out of me! I love black pudding too, and I have a recipe to post with it as well soon! I love the idea of stirring it into mashed potatoes! Treacle is essentially what Americans call molasses – syrup left over from sugar production. In Britain, the lighter, honey-like treacle is commonly known (and sold) as “golden syrup”, and is often used in much the same way as maple syrup (though sweeter and less tasty), while the dark stuff is called “black treacle” and forms an important part of the traditional Christmas Pudding. I’m so glad that even the “white bits” *aren’t* black; otherwise, we couldn’t see this very dramatic, high contrast shot. It’s a stunner, Wendy. Thanks for your BWW photo.